Betty J. Hall, 88, of Fond du Lac, died Thursday, January 31, 2019 at St. Agnes Hospital. She was born in Fond du Lac on Monday, August 25, 1930, a daughter of Fred and Pauline (Paul) Meisner. On Saturday, September 30, 1961, Betty married Howard “Howie” Hall at Church of Peace UCC in Fond du Lac. He preceded her in death on Sunday, January 10, 1999. Betty loved being grandma to “her girls”, Olivia and Madalyn, as it was truly the highlight of her life. She loved God, her faith and was a member of Church of Peace for close to six decades. Betty loved to play cards, share jokes, cook and bake for her family and friends. For every visitor to her home, she would always have a sweet treat, never leaving her candy dish empty. Betty worked for the Infant Socks Co. of Fond du Lac and retired from the Fond du Lac Lutheran Home as a housekeeper. Survivors include a son, Chris (Heather) Hall; two granddaughters, Olivia and Madalyn Hall; special friend’s, Jack (Janet) Witte; and many nieces, nephews, and other relatives. 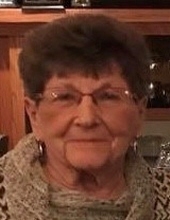 She was preceded in death by her parents, Fred (Pauline) Meisner; her husband, Howie Hall; an infant son, Scotty Hall; eleven siblings, Helen Schumacher Williston, Mary (Leo) Reich, twins Albert (Helen) Meisner and Alma (Garhart) Roth, Elsie (Russell) Strelow, Jerry (Mary Lou) Meisner, Eugene (Betty) Meisner, Barbara Hutter-Daily and three infant brothers, twins Reinald and Robert Meisner, and Leo Meisner. A visitation will be held from 4:00 PM – 7:00 PM, Monday, February 4, 2019 at Uecker-Witt Funeral Home, 524 N Park Ave in Fond du Lac and again Tuesday, February 5, 2019 from 10:00 AM – 11:00AM at Church of Peace, 158 S. Military Rd. in Fond du Lac. The funeral service will begin at 11:00 AM with Rev. Jack Kraaz officiating with burial in Ledgeview Memorial Park following. Chris and Heather would like to thank the family and friends in the Fond du Lac area that helped Betty in so many ways over the past few years. To send flowers or a remembrance gift to the family of Betty J. Hall, please visit our Tribute Store. "Email Address" would like to share the life celebration of Betty J. Hall. Click on the "link" to go to share a favorite memory or leave a condolence message for the family.